Saturday was yet another fantastic day of harvest as Vellum's friends and family gathered in Napa to pick our last vineyard of the season -- 9 tons of Cabernet Sauvignon. We started at 7:00 am, gathered around a campfire, with Karl instructing the crew on which clusters to harvest and which to leave on the vine. A full week of sunshine had dried out the grapes, concentrating the sugars and intensifying the flavors. Karl guided the harvest by removing clusters ahead of the crew - he pulled all of the grapes that had dried out or been snacked on by wildlife. A slight dew was present on the grapes while we were picking, which made them look white in the flash of the cameras. And I was proud to clip the first cluster of the day with my Dad! Thank you to everyone who joined us: Jerry and Marsha Linstad, Bill and Robyn Mathy, Mary and Ralph Burklow, Kate Olbrantz, Ashley Humann, Pam Linstad and family, and Michael and Barbara Hirst. The Cabernet is now crushed and in its fermentation tank. We will inoculate with yeast today to begin the winemaking process. 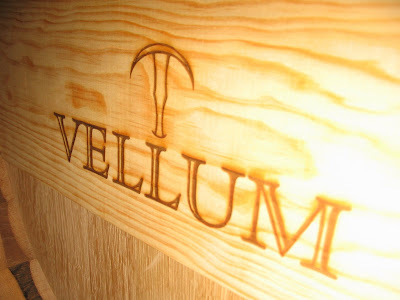 REMINDER TO VELLUM INVESTORS: Vellum's Harvest Party is this Saturday, Nov. 3rd. Call Jeff to R.S.V.P. at 714.726.4369. On Wednesday evening Karl and I took a break from Vellum's harvest to attend the Wine & Spirits Top 100 celebration to honor Karl's contribution in creating a stunning 95 point wine from the 2005 vintage. The event took place at the The Golden Gate Club at the Presidio in San Francisco with over 400 winemakers and trade professionals in attendance. The highlight of the evening was the opportunity to sample many of the Top 100 wines with our personal #1 pick going to Morey-Blanc's Corton-Charlemagne Grand Cru ($175). This Burgundian chardonnay is quite possibly the best white wine we have ever tasted! We were lucky enough to sample the 2004 vintage which received a score of 92 points from Wine & Spirits. The best way to describe this wine is - minerality and stoniness. With additional scents of chamomile and jasmine, the chalky limestone mouth feel brings this chardonnay to the top of our list! Well done! This year we have already had two sets of rain and the forecast suggests that another is to follow. But we will weather the storm and harvest on one of the many successive sunny days that follow. No good can come from picking early. Our Linstad Cabernet in the Tulocay area of Napa is still out there but it is simply not ready yet. The area is known for unusually long hang time, slow maturity and good concentration without excessive sugars. We selected this site for these reasons and we have full confidence that it will perform as such, despite the weather. So, I don't believe in knee jerk reactions, I don't believe in crisis management and I don't believe in changing my nature because I cannot change mother nature. Around Napa Valley when people see rain in October blood pressure goes up, trucks scramble around the valley and wineries end up working even longer days and nights. Moods take a sharp nosedive and that translates directly to the wine. Here's my solution: Don't panic! When cooler heads prevail better wine will be had. This is to be a joyous time of year for all of us! We are giving of ourselves to give life to something we dearly believe in. What ever we do and feel - the wine knows! The fermentations are going very well with the brix levels approaching -1.5 quickly. We will probably press off the Merlot on Tuesday and then perhaps the Petit Verdot by Friday. The three harvest days we've had over the past two weeks have kept us on the move - at the winery taking samples, back at the lab analyzing the juice, walking the rows of the last vineyard still hanging. The first day of Harvest, pulling the Merlot on September 29th, was a whirlwind day filled with great memories. Friends from Fullerton and San Francisco drove up to help us bring in the grapes. Andy, Sam, Guru - thanks guys for hanging out with us and supporting Vellum. My nephew William was the most excited of us all! He found his way INSIDE one of the harvesting bins and we found him eating as many grapes as he could fit in his mouth. One word was all he could say in between mouthfuls - GOOD. GOOD. GOOD. See the slide show below for a photo recap! We still have Cabernet on the vine, holding tight at around 23 brix. Karl and I are waiting for the sugars to rise just a little more before pulling the fruit. It will probably be another 10+ days before we are ready to bring it in. All the while the grapes continue to gain maturity and complexity! Karl's going to be adding more about the fermentations tomorrow. Yesterday we harvested the first lot of Vellum Cabernet Sauvignon, 3 tons from Napa's Chiles Valley. After transporting the grapes to the winery, the grapes were destemmed and pumped into large stainless steel tanks. The fermentation in the tanks is only the first phase of winemaking, an 18 month exercise in patience and restraint. We've put a great deal of effort into assuring ultra-premium quality by choosing the finest grapes and careful methodology. 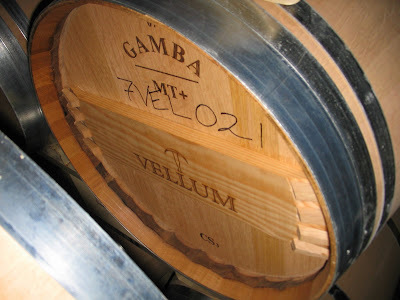 I look forward to the day friends and family are able to enjoy the Vellum 2007 Cabernet Sauvignon, our first vintage, and I'll reflect on the harvest with fond memories.